Engineers love keyboard shortcuts. 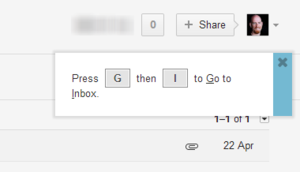 So, like most Google products, Gmail offers you the ability to do pretty much anything with a keypress, from composing a new message (c for compose) to going back to the main list of emails (u for up). These keyboard shortcuts are one of Gmail's best features: they let you compose, archive, forward, and reply to messages, move between labels, search, and more, all without reaching for your mouse. Alas, they're also hard to learn. After enabling keyboard shortcuts in the Settings screen, you can hit "?" to get a semi-transparent overlay listing all shortcuts. For some people, looking at a long list isn't the best way to learn–and KeyRocket thinks it can do better. Every time you use the mouse to do something your keyboard can do, KeyRocket would let you know. Veodin's KeyRocket for Gmail sits in the background as you use Gmail, and quietly watches your every move. As soon as you tick the checkbox next to a message (to select it), it pops up a discreet notification letting you know you could have just hit "x" on your keyboard to do the same thing. When you hit the Reply button, KeyRocket informs you that "r" would have worked just as well. Because the messages are contextual, they are much more useful than a help sheet: You learn in bite-sized chunks, and only about those functions you actually use. KeyRocket makes key combinations easy to understand. KeyRocket isn't perfect: Ideally, it should be able to tell when you already know a shortcut, and just prefer using the mouse now and then for the same function. KeyRocket shouldn't tell me about the "#" shortcut the one time I use the mouse click the button. 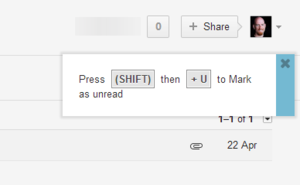 Still, despite this minor flaw, KeyRocket is an excellent learning aid for Gmail.